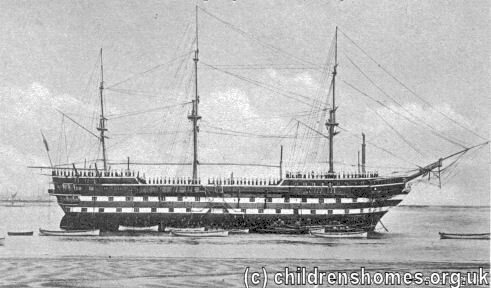 The Training Ship Exmouth was established in 1877 to replace the Goliath, which had been destroyed by fire two years earlier. 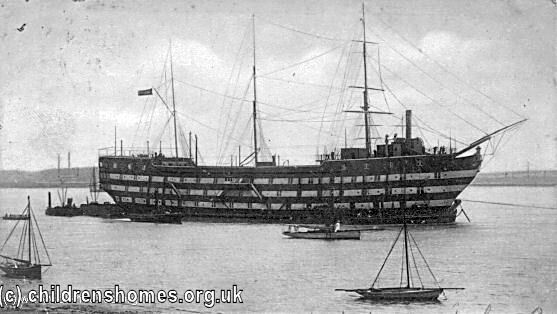 The Exmouth was moored on the Thames off Grays in Essex and was managed by the Metropolitan Asylums Board. The ship was an old wooden two-decker line-of-battleship, built in 1854, which had carried the flag of Admiral Seymour in the Baltic during the Crimean war. A news report in June, 1877, recorded an official visit to the ship. The President of the Local Government Board, Admiral Phillimore, and the managers of the Metropolitan Asylums Board, paid an official visit to her Majesty's ship the Exmouth, lying off Grays, in Essex, which has been instituted as a training ship for boys chargeable to the poor rates of the metropolitan parishes and unions. The Exmouth takes the place of the Goliath, destroyed by fire last Christmas twelvemonth, but is under different control. A few East London parishes, under the name of the "Forest Gate Stool District," in order to provide a marine training for boys chargeable to the rates in their parishes, had taken the burden of providing the Goliath, and when that ship was burned we suggested that this important work should in future be undertaken by a body representing the whole metropolis — by, in fact, a body with such wide powers as are possessed by the Metropolitan Asylums Board. The President of the Local Government Board immediately adopted the suggestion. The Admiralty placed at the service of the metropolis the fine ship now in use. The whole cost of refitting the ship and the purchase of the property belonging to the Forest Gate District has been £30,000. 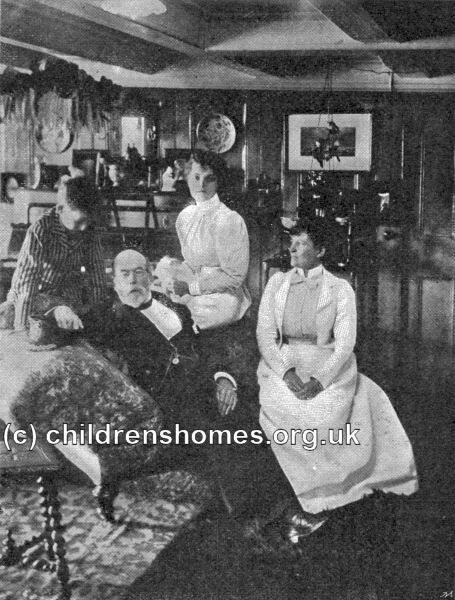 For this sum accommodation has been made for at least 500 boys; for whom, if like provision had to be made on land, the cost would be £50,000 or £60,000. 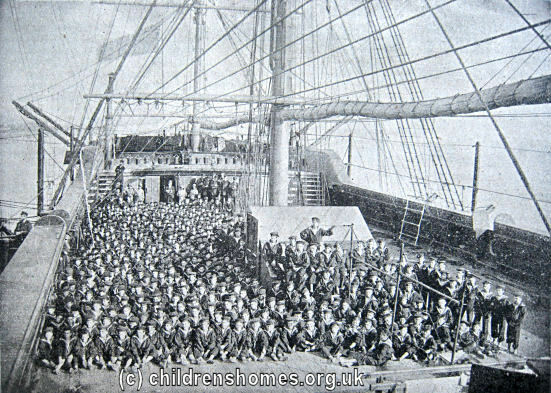 We say the provision is for "at least" 500 boys, because, as the ship in the Baltic had a crew of 750 men, room could be easily made for more boys, especially as 30 are in training on the brigantine, where their training is completed, and some are usually in the house on land. The actual cost per head is 11s. a week; but, allowing for the aid given from the Imperial rates for school teachers and seamen instructors, the cost is 10s. 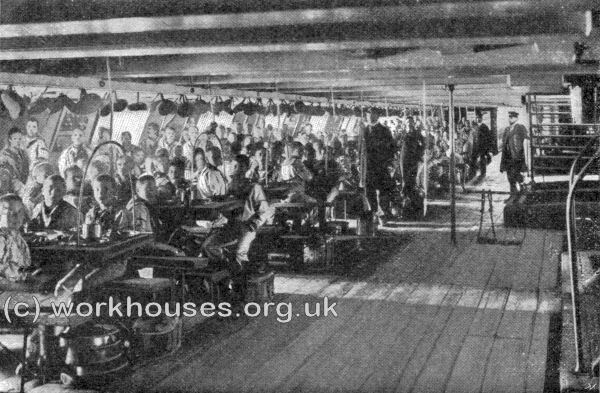 a week for each boy taken from a London workhouse and trained for the Imperial or mercantile marine. On reaching the causeway, the ship was found to be in holiday trim, the boys "manning" the yards of both the Exmouth and her tender; and the boat crews awaiting the visitors were in sailor fashion saluting. 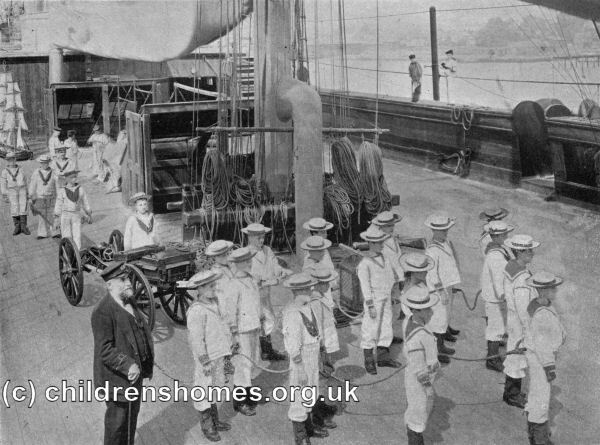 When on board, Admiral Roberon, the chairman of the committee, and other members of the committee, accompanied the official visitors in an inspection of the nearly 300 boys drawn up at "open order" on the deck. The ship is commanded by Captain Bourchier, RN. The boys, all of whom were dressed in sailor fashion, looked exceedingly well. The lads drilled fairly well, and marched well to the music of a hand. The visitors were then taken over the whole ship, and all the arrangements were minutely inspected. 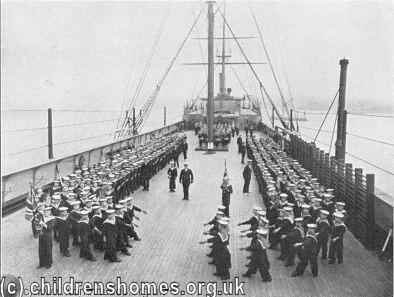 Upon their return to the upper deck the boys were drawn up to form three sides of a square. Admiral Roberon, addressing the President of the Local Government Board, acknowledged the great help given by the Local Government Board and by the Admiralty in the work. While the ship, he said, was being prepared, the committee had kept 120 boys in training in the home and on the brigantine, and in December last they were transferred to the ship ; since which time 349 other boys had from the London Poor Law Institutions. Of the first 120, there had been 17 discharged to sea; and he ended by asking him to present the prizes awarded to boys for proficiency in the various branches. The President congratulated the managers upon the lads' appearance and performances. Only one fourth of the present ship's company, he said, were on the old Goliath, and therefore three-fourths had been there at the most some six months. That in this time they had become so sailor-like and well-disciplined was a credit to themselves and their officers. The prizes were then distributed, most of them being good books of fiction, travel, adventure, and instruction. The party then had luncheon. Afterwards, the visitors were entertained by the boys dancing hornpipes, playing at single-stick, and athletic exercises. Boat-races were organized, the prizes being subscribed by the visitors. At the close of the day's proceedings, the boys again manned the yards, and gave their visitors a parting cheer. It may be mentioned that the London School Board propose to try and set up a ship for the industrial school class. The training ship Warspite, at Woolwich, is under the Royal Marine Society, the oldest training-ship society, and, like the work of the Chichester &c., is carried on by voluntary subscriptions. Boys were able to join the ship from the age of twelve. Their first task was to learn how to mend and patch their own clothes. They also had to learn how to wash their clothes, and keep their lockers and contents in good order. 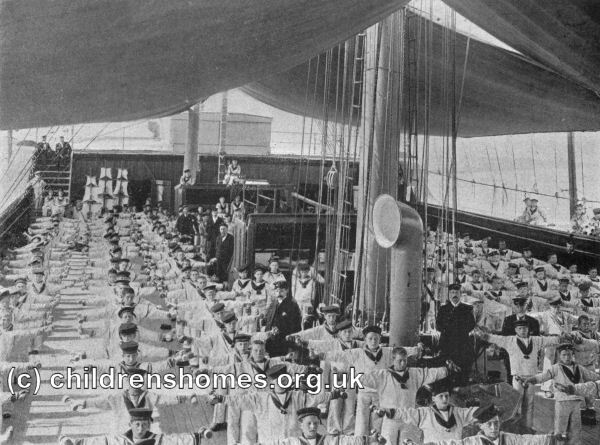 Each boy had his own hammock which was stowed during the day, leaving the decks clear of bedding. 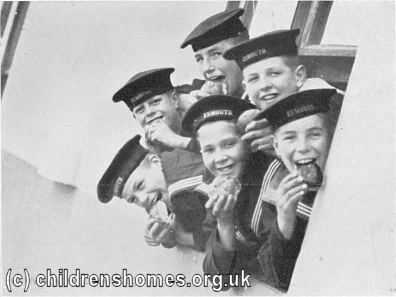 As well as learning the skills of sailing, rowing, sail and rope-making, gunnery, and signalling, they continued ordinary school work, and other physical activities such as swimming and gymnastics. 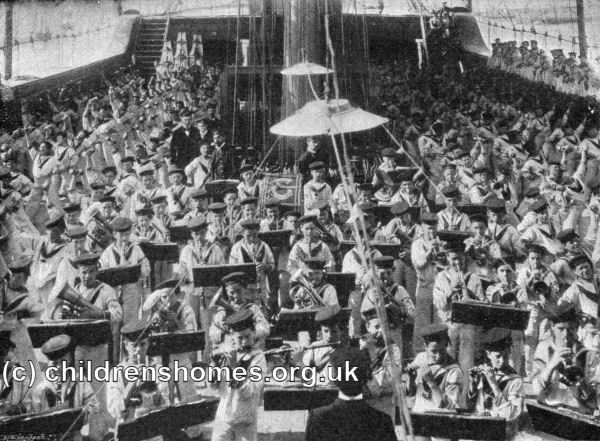 The ship had i own band and bugle-band. 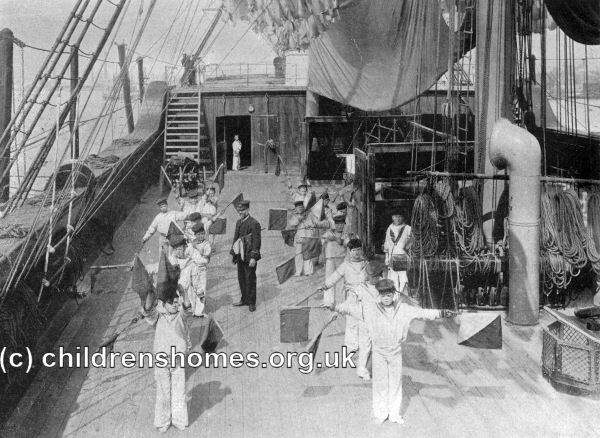 In 1892, admission to the ship was extended for up to 50 boys from parishes and unions outside the metropolitan Poor Law Area. 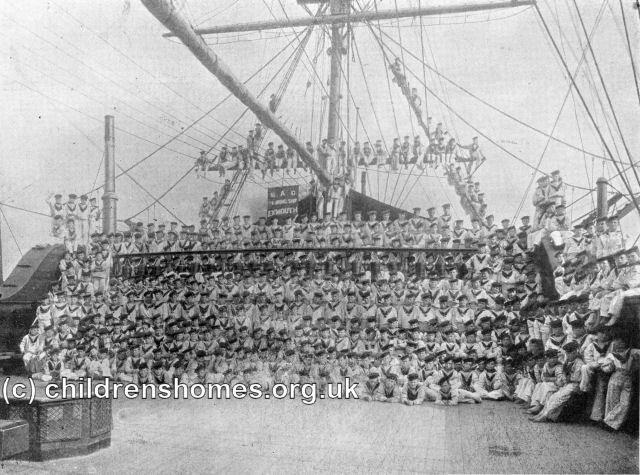 In 1896, 137 boys entered the Royal Navy from the Exmouth (compared with a total of 135 from all other training ships in the country combined). In 1903, the ship's hull was found to be in an unsafe condition and was condemned. A replacement of similar appearance, but built of iron and steel, was commissioned from the Vickers company in Barrow-in-Furness. The new Exmouth was towed round the coast to Grays where she was inaugurated in August 1905. 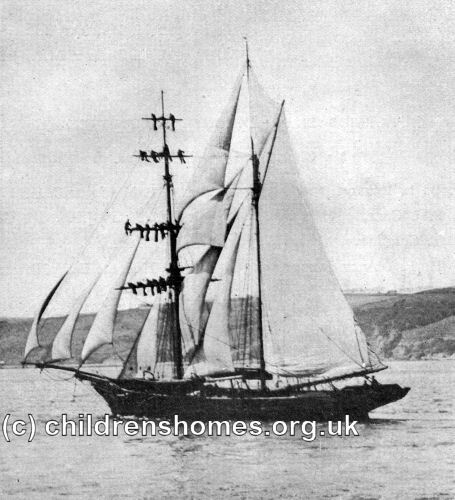 The Exmouth had a companion ship, a brigantine called the Steadfast, used for cruising and to provide the boys with practical training in seamanship. The original Steadfast condemned in 1894 and replaced by a new vessel of the same name. Onshore at Grays, a playing field, swimming bath, and infirmary were provided in an old manor-house called Sherfield House. The Exmouth remained at anchor of Grays until 1939. During the Second World War, the boys were evacuated to Lydney, Gloucestershire, with the vessel being requisitioned as a depot ship and renamed the Worcester. She was finally broken up in Bruges in July 1978.